I always wonder about these things… what is the difference between we human beings and animals? They are also living being, then what is the difference? This thought comes again and again in my mind. Recently when I was watching the movie Ice Age 2: The Meltdown. The thought again came in my mind – whats the difference? Most interesting part is – the protagonists in the movie are animals. Whenever I watch that movie, one character pops out – “on the face” – often and it reminds me of us – the human beings. It is the squirrel – Scrat. In every screen it is fighting for its corn – similar to our life. The corn represents our jobs, loved ones and issues faced regularly etc etc and alas! the list never ends. And secondly, the fight and the run never ends! Cogito, Ergo Sum is a philosophical statement by Descartes, meaning – I think, therefore I exist. Yes the proof of ‘my existence’ is that at least I am thinking that whether I exist or not, right? And the question of my existence is not just about existence; it is deeper, why are we doing what are we doing? And even further it goes to why do we exist? Because perhaps even without thinking of existence animals exist, right? And here the logic fails, I have heard saints saying – life does not listen to your logic. There has to be some reason of us having a more developed brain which gives us the capabilities to think about our existence and the question – why we exist? It is similar to phophobia – fear of phobia, existence of the question of existence :). Whatever the case is – I think, therefore I exist! 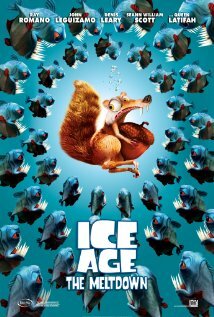 And we all exist like the Scrat in the mids of the fish (e.g. ourselves, our friends and enemies) trying to save our corn e.g. ourselves, job, loved one etc etc.